Residential Spiral Staircase: Aluminum All welded construction. Model 60 FASS Arc Pattern Steps, 4 Line Pipe Rail, 1 1/2" Rd. All stainless steel spiral stairs are unique and uncommon being used in the exterior for corrosion resistance in coastal applications. Stainless steel spiral stairs can be used interior when the surroundings have a modern feel. 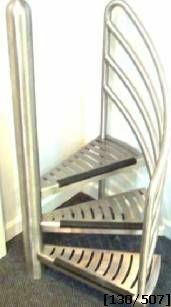 When Stairways Inc produces a stainless steel spiral stair, a painted finish or coating is not required. Three common finishes are available. First, Mill Finish: When a spiral stair has a mill finish, the stair is fabricated and shipped without buffing or polishing the material. Mill finish is perfect industrial applications when appended is not important but corrosion resistance is at a premium. Second, and most common, Stainless Steel Brushed Finish: A brushed finish resembles kitchen appliances made in stainless steel. A brushed finish will have all grain moving in the same direction. Third, Mirror Finish: This finish when completed will look like chrome. Stainless steel spiral stairs are available in all diameters and in any height needed.